Anachronism as a way of life? Does the implosion of Dewey & LeBoeuf foretell the future of the law firm and practice as we have known it for generations (and possibly the accounting firm as well)? Does it expose the need for – and possibly the inevitability of — substantial change in the roots and essence of the practice of law — its governance, its business models, and most significantly – its sources of capital? Is the cause for Dewey’s failure endemic to the legal profession itself? Or is Dewey just a one-off bad situation for one firm? To what extent did traditional firm structures and business model allow for mismanagement, excessive debt, and greed … and the destruction of Dewey, and ultimately, other firms? Is it these problems that are causing the rash of not only firm failures, but the rash of mergers throughout the profession? A corollary question might be why, after generations of the traditional models for law firm management, business models, and practices, do we now see the growth of new firm structures, new sources of capital, new concentration on value, new emphasis on client relations, and most significantly, on frank promotional marketing? While, by now, we have a picture of how the Dewey disaster happened (give or take a fact or opinion or two), to make sense of it, and its path to bankruptcy, we need to understand the role of evolution in the ultimate development of the current and future practice. Where, for example, does Dewey stand in relation to the modern innovative firms that are beginning to spring up – that are succeeding with new practice models that are far removed from the practices of the past? How much does Dewey’s practice model account for its disaster, and what does that tell us about the future of the tradition law practice business model? The downfall of Dewey and so many other firms has its roots in Bates v. State Bar of Arizona (U.S. Supreme Court, 1977), which in essence struck down the traditional prohibitions against advertising, and by extension, other forms of standard promotional marketing techniques. Competition started the evolution toward today’s modern firm – and to the firm of the future. As one firm adapted to the changing dynamic needs of the time, another firm, facing the need to compete, adopted those changes and went a step farther. The pressure to compete has been the driving force for the firm that’s still evolving. As firms began to compete in earnest, many learned that the traditional law firm business model didn’t readily lend itself to strong competitive practices. It inhibited innovation and made timely decision making difficult. It’s financial structure, which limited capitalization primarily to partner contribution, is cumbersome and inadequate. In too many firms, its management structure is primitive. Certainly, it rarely makes full use of the skills and talents of people below partnership level. In the decades since then, new firm structures, business models and practices have evolved to meet competitive needs. 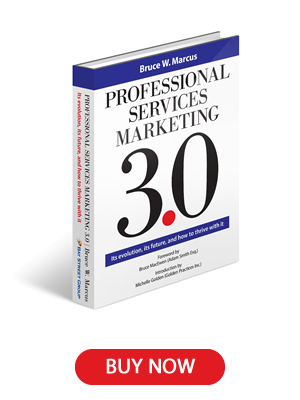 (See Professional Services Marketing 3.0) Focus on client needs, rather than on the needs of the firm, began to increase. There began to be new awareness of the role of productivity in better and increased profitability and practice development. Integrating marketing structures with practice structures began in earnest. Supporting the evolution, technology accelerates change by substantially improving competitive productivity. The fee structure started to change from hourly billing to value billing and is increasingly growing as a general practice, and focus on the concept of value is increasing as well. The-two tier structure to better use associates and their talent increased. And ultimately, a better understanding of 21st century competition, and the role of each partner and associate in competing for clients, has been growing and changing. A clear view of the Dewey implosion shows that despite this evolution, and despite the profound changes in commerce, in technology, in society, Dewey was a consummate anachronism. In Dewey’s case most of this evolution seems to have passed them by. And according to experts, Dewey is not unique in this. Greed, and apparent failure to focus on its market, and to concentrate instead on partner compensation and reward – which appears to have been inequitable at best. How has each of these factors contributed to Dewey’s failure? What does each tell us about the future of the profession? What should firms do now to stay relevant to its present and future clientele? Let’s examine each element. I’ve often said that the partnership structure of law firms was antique – an anachronism – cumbersome at best — and most significantly, not consistent with the needs of the late 20th Century and the 21st Century. It places too much managerial power in the hands of too few partners, few of whom are trained in the kind of management that today’s practice needs. Compensation tends to be inequitable, and the top-down pyramid structure creates a class system based on factors other than legal talent. It too frequently inhibits timely decision making. It is anti-competitive, in that it makes marketing decisions, which may have to be approved by many partners, cumbersome. In too many firms, the focus is on growth at any cost to bolster a firm built on the traditional model, and is often achieved by acquisition rather than by practice development. In fact, it raises the question about the efficacy of the giant firm. Managing a thousand lawyers, each of whom thinks of him or herself as entrepreneurial, is not the same as managing a company of a thousand factory workers, particularly if each lawyer in a large firm tends to be entrepreneurial. The concept of David Maister’s one firm-firm is too quickly lost. The drive for growth inevitably compensates the business producer over the client service practitioners – in Dewey’s case, profoundly out of proportion to client needs. It diminishes productivity and inhibits profitability. The world of commerce has changed substantially, and so too, has the environment in which professional firms must function. Yet despite these and other significant changes in commerce, society, and technology, the world of professional services has changed too little – frozen in structures and patterns still rooted in the early 20th century and back. It is, then, a new world – one that’s beyond the experience of a great many senior lawyers and accountants. Nor do the schools help. Law and accounting schools, as well as many state bar associations, are seething fountains of anachronism, teaching students to be 1940 lawyers and accountants and then sending them out to practice in a 21st Century world. Confidence in current legal education is waning, and respect for many of the bar associations is diminishing. If greed there is, then it’s the old practices in a new world that breeds it. That their leadership seem to have been too concerned with their own profits and compensation apparently took the focus away from addressing the changing market, which probably put the focus on internal growth rather than addressing the needs of the marketplace. While there is obviously a picture of extreme rot at the heart of the Dewey disaster, a longer view of the details indicate that the reasons for the implosion indicate potential disaster that goes far deeper than just one firm. Look at what happened at Dewey. Says Bruce MacEwen, the noted lawyer, economist, and journalist who as Adam Smith, Esq., writes one of the most cogent and elegant of the online law journals. 2010 bond issue, privately placed with insurance companies, $145-million coming due in tranches from 2013 to 2020. The largest purchasers were Hartford ($45M), the British firm Aviva ($35M), and the Dutch AEGON ($25M), accounting for $100 of the $145M. Bloomberg reports the bonds are trading at 60 cents on the dollar. Note that the compensation was promised and payable without regard to the individual’s or the firm’s overall performance, and that such guarantees are, to be charitable, ill-advised for laterals and unheard-of for incumbents. A law firm’s typical lease obligations on everything from AAA office space to computers, furnishings, and fixtures. If any of you out there believe priority and security don’t matter because the firm will be able to satisfy all the claims against it, I’ll be peeking inside your medicine cabinet while you’re out snapping up those $0.60/$1.00 bonds. To this sorry picture there is the smell of the pure greed of a handful of the firm’s leaders. Says Jordan Furlong, another leading law practice blogger and a principal of Edge International, “I’m less inclined to blame unsound management and more likely to blame a central cohort of leaders who seem to have lost touch both with reality and with their duties to hundreds of their partners, associates and staff. At the same time, where were the rank-and-file partners paying attention to and protecting their equity ownership? I don’t see any heroes in this mess. Greed can exist anywhere in the professions, but the ground for it must be fertile for it to thrive. What, then, does the Dewey failure tell us about the future of the professions and their structure and practices? How radically will firms have to change to be competitive in the future? Giant firms may be too big to manage. The boutique firm may be the wave of the future. The current partnership structure is inadequate to the needs of law firms to function in a dynamic economic, regulatory, and social world. In periods of rapid firm growth and consolidation, firms can’t continue to be financed primarily by partner contribution and debt. Without trying to answer these questions with sheer prognostication, which is impossible, the past and the evolutionary process suggest that new business models are emerging. Not to be overlooked is the role of technology, which is itself constantly evolving. It’s use as a competitive tool is increasing, and there are now relatively few firms that are not using technology to great advantage. An example is the growth of the mobile office. There are now very few technology-illiterate lawyers. A possibility that’s been shot down in the past is melding the two professions, in large part because of the disparity in practice and temperament. But like everything else, when it proves to be advantageous to both professions, it can happen. Reexamine the skills of associates, particularly those that might otherwise not possess partnership skills. Compensate their skills appropriately, and not on arbitrary factors, such as longevity. Is the Dewey disaster an impelling force for change in the profession? To a degree, yes. It would be hard to look at the factors described here and not see at least a warning – an alert to the shortcomings of the traditional firm in the 21st Century. The evolution of the future firm, like the evolution of human beings, is a slow process. But it’s happening. Now.